There's no doubt that Mom's are the glue that hold our lives together. Your Mom always knows how to make you feel better, how to solve your problems, and how to make you feel extra special. Celebrate all the Moms in your life on May 14th - and maybe even cement your place as the favorite! - with this Mother's Day gift guide! New moms are very sentimental. (Maybe it's all the hormones?!) Gift something full of meaning, like a necklace with baby’s initials, birthdate, or thumb print, like this one! Fact: Moms love photos - especially photos of their Grand-babies! You can create these photo books through ChatBooks, which pulls photos from your cellphone, Instagram, Facebook, or through good ol' fashion uploading. There is no formatting required. Not only are the books easy to make, but they're affordable. In fact, your first book is free! Map it out! There may be distance between you and your Mom, but with something like this map artwork, it'll seem like she's right next door. Pampering is always appreciated by Moms. Consider gifting your Mom a mani/pedi, or a relaxing day at the spa! The gift of fitness goes a long way! For Moms who love to be active, gift them a subscription to ClassPass - a service that allows you to try different types of fitness classes, at various studios, in their city. She can go to a spin class one day, then to aerial yoga the next! A fancy water bottle makes drinking water all day long so much better, am I right?! If your Mom is a busy bee, this gift will be a welcomed companion. This daily planner will help Mom put herself back on the list. 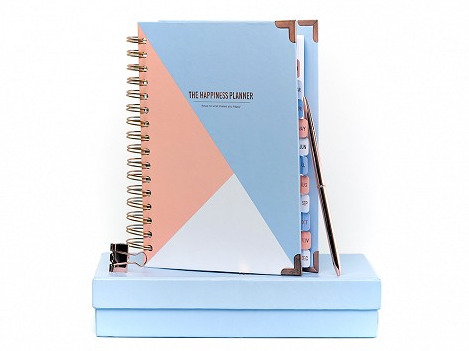 It serves as a planner - which will be helpful for those task-oriented Mommas - but it also incorporates both daily and weekly exercises, aimed to help you reflect on what brings you joy, and focus on making it a habit. Dig up old video clips and/or photos, and create something to show Mom just how much you care about her. She'll cherish the memories and walk down memory lane! Nothing makes a Mom happier than photos of her children (and Grandchildren!). Consider gifting your mom a photo session with a professional photographer. Come on, when was the last time you took a photo with a real camera and not your iPhone?! Get the family together and capture some memories - your Mom will love this gift! Moms sure do love their wine, don't they? Well, there's a reason for that. Make happy hours a bit fancier. This ice mold from Crate & Barrel can freeze as is, or incorporate berries, citrus slices or fresh flowers before being frozen. Help mom organize all those macaroni necklaces she's still holding on to with a bright and beautiful lacquer box, like this one from Lilly Pulitzer. Expanding upon each post above, here are links to more products for some of the different mom "types"!